We recently met with some old friends. Five years ago we sold five Mobilis JET 9000 navigation buoys to be used as temporary navigation aids during the construction of a wind farm. That project was completed and the buoys spent a couple of years in storage, before the customer decided to sell. That’s when Hydrosphere next heard about them. The new owners, Vattenfall, had bought them for the Aberdeen Offshore Wind Farm and asked us to refurbish them before they were re-installed at sea. Three years offshore and another two lying around in storage might take a toll on some bits of kit, but not the JET 9000! We already knew that these buoys were built to last; their polyethylene hull floats have a UV 18 rating, so you can expect a lifespan of over 15 years. However, it was great to see how well they had faired, and how little refurbishment work was required. Work was carried out at Peterson, Aberdeen, where we used their experienced team to refurbish the five buoys. Partnering with suppliers that work to our high standards of quality control was essential to ensure that the buoys were in optimal condition for delivery to Vattenfall. 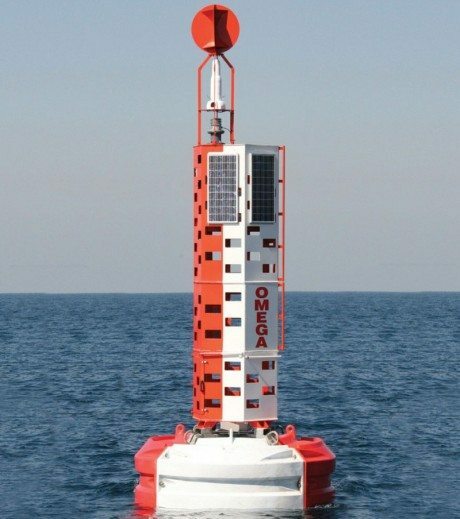 One of the main benefits of the Mobilis modular system is that parts can be easily replaced without compromising the buoy in any way. As it turned out, the refurbishment project was minimal. One buoy had suffered some damage during transportation, which was repaired, and the anodes on all buoys required routine replacement. As part of the refurbishment we checked and inspect all the lights, as well as tracking and monitoring equipment. We also inspected the moorings and as you would expect having spent time at sea, some components were replaced. This was also an opportunity to upgrade the East cardinal buoy to install a Datawell wave sensor and Gill weather station. These additions have saved Vattenfall a significant amount of money. Instead of spending upwards of £60,000 on a standalone wave monitoring buoy, they have all the technology needed on an existing asset for a fraction of the price. Wave sensors and weather buoys are invaluable for offshore projects. The beauty of a navigation buoy the size of the JET 9000 is that it has scope for multiple uses, not just as an aid to navigation. As seen with this project, the platform is ideal for carrying a range of data sensors and equipment, and therefore it can be possible to avoid the additional costs of a data platform buoy. While the buoy refurbishment project didn’t involve any repainting as the condition of existing paintwork was very good, we did give one cardinal buoy a new set of colours. This one required painting in new colours so it can be used in a different way than on its previous job. At the same time we also had new signage made up to reflect the buoys’ new owner and site. With annual maintenance these Mobilis navigation buoys are now fit for purpose for perhaps another 10 – 15 years. You can download the datasheet here.